I tried getting Razer support to give me schematics, but no go. Also, I can’t find any schematics on the net either. I did figure out by looking at the board that it is a dual switched power supply (two bucket converters), which implies that there are dangerous voltages on the board. Not only that, but you can’t safely ground anything on such a board, so that connecting a mains powered oscilloscope will typically result in your ground fault breaker to trip (if you’re lucky) or your oscilloscope to short out and die (if you’re less lucky), or you yourself to short out and die (I know, not funny). Troubleshooting setup. The isolation transformer is to the left. 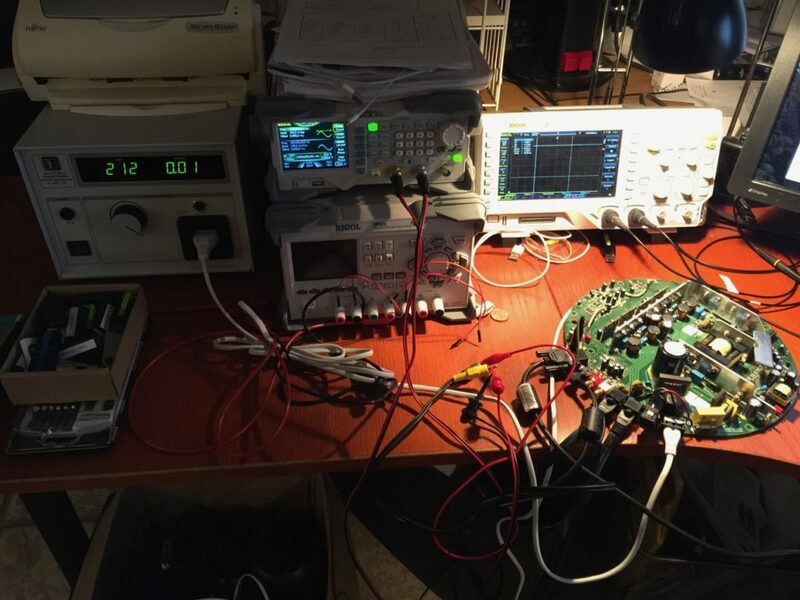 To be able to work on a device like this with a scope or signal generator (anything that needs instrument ground to connect to the device under test), you must, absolutely must, power the device through an isolation transformer1. But even then you need to be very careful, since even though you eliminate the ground loop problem, you can still electrocute yourself just fine by grabbing onto the less advisable parts of the device. So unless you really, really know what you’re doing, and you use an isolation transformer, I’d suggest you never work on the Mako with power connected2. I’d suggest, if you don’t have all the gear I’m using, to simply unplug the Mako, let it rest a while, open it up, then replace the capacitor I’m mentioning below, then put it all together and test it. For disassembly, see my earlier post about the click of death. I then fed the inputs with a sinus signal of 500 mV and a few hundred Hz and found it was present on the ADC0 or ADC1 inputs of the ADAU1701 chip (depending on if I connected to left or right channel input), so the preamps worked. But checking on the VOUT0 through VOUT3 outputs of the ADAU1701, I found nothing but a high frequency noise signal just under 60 kHz. Touching some of these outputs made the speakers click, so the power amps were probably also ok. I then checked the power going into that chip and it looked awful, around 3.3 V but with a 60 kHz signal overlay of more than 200 mV. A horrible ripple, in other words. The Analog Devices ADAU1701 is right in the middle of this (slightly unsharp) picture. That, to me, meant that a large smoothing capacitor must have failed. 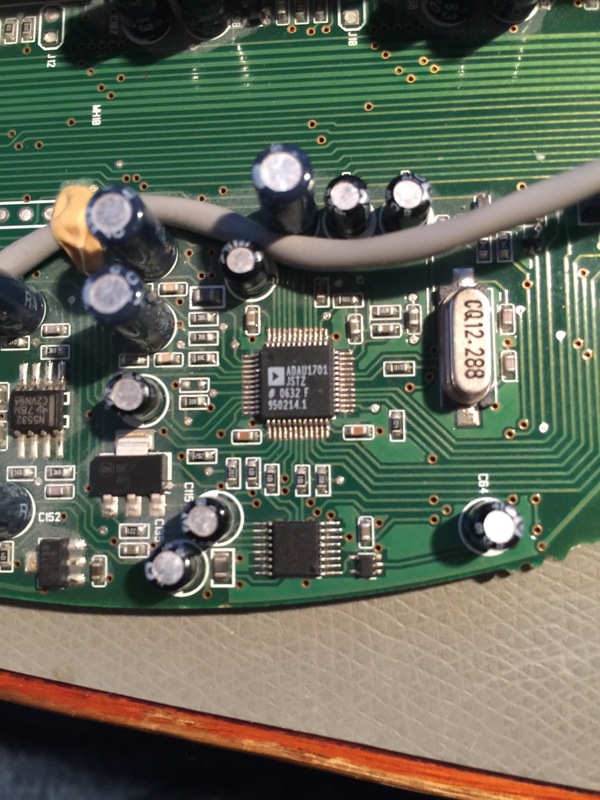 The huge ripple on the power line must have severely screwed up the workings of the ADAU1701, which is a ADC/DAC signal processor and which does practically everything that needs to be done to the audio before going to the power amplifier stage. No wonder I had no sound. Back to capacitors, then. 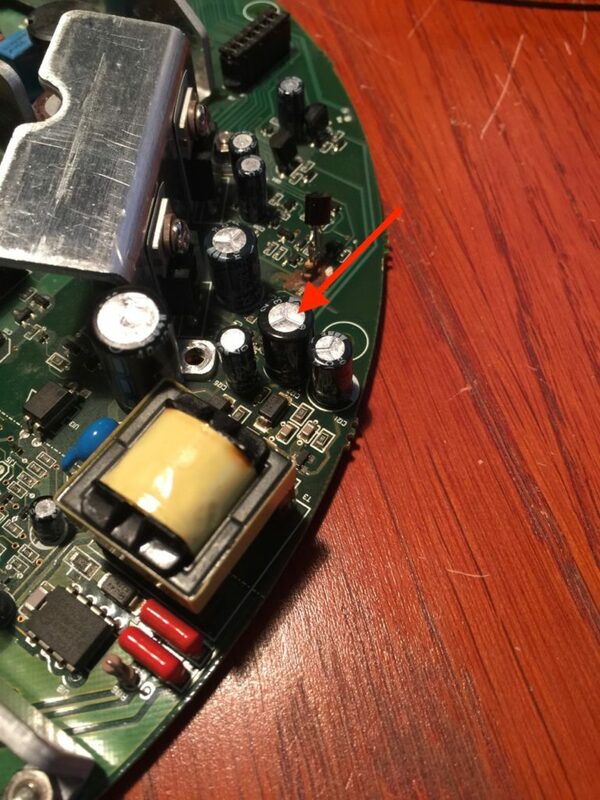 I could not see any bulging capacitors, but feeling around I found one that was so hot it almost burned my fingers. And that is really not normal. If this cap was shorting out3, it would explain everything, and sure enough, after replacing it, the system now works normally. The bad capacitor was labeled C122 on the board, a 330 µF/25V, which I replaced with a 470 µF/35V, simply because I had no 330 µF at 25V or more. Seems to do the trick, though. The hot capacitor. Red arrow points at it. 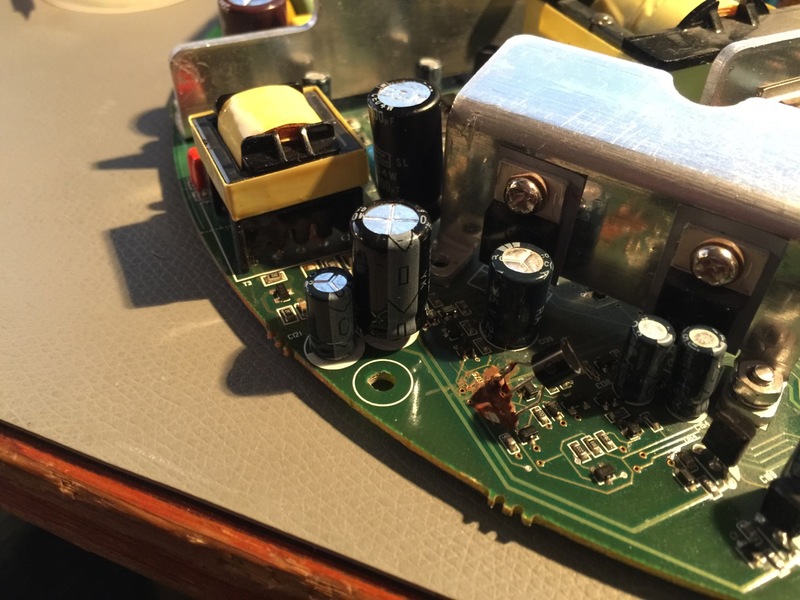 Moral of the story: if you have a Mako with no clicks, no sound, and a semi-working control puck, try replacing this capacitor. There is a decent chance it will work. Update 2018-11-21: Ohan Smit kindly contributed a list of all electrolytic capacitors in the Mako, very handy if you want to replace them all. Since it’s well neigh impossible to make a readable table in the comments, I added this table here. List of electrolytic capacitors found in the Razer Mako (list contributed by Ohan Smit, see comment section). You can also use a “differential probe” which is better at protecting your oscilloscope than an isolation transformer. But the isolation transformer is better at protecting you from electrocution, but only if you know what you’re doing. The isolation transformer, for instance, makes it less likely that your ground fault breaker will trip, so it’s a mixed blessing. Also, there are some big capacitors that may retain charge quite some time after unplugging, so give the device time to discharge before you touch it. It wasn’t “shorting out”; it was degrading with an increased internal resistance (ESR), which is almost the opposite. See my next post. I have replaced both capacitors now and still no luck with powering up my system. Controll pod does not light up, but there is power all over the mother board? Really frustrating! There are several different power systems in the Mako, I think three. You could check if the ADAU1701 gets power. Check pins AVDD and DVDD (for pinout, see datasheet at: http://www.analog.com/media/en/technical-documentation/data-sheets/ADAU1701.pdf). It’s very fiddly; the pins are tiny. And, be careful where you rest your hands! Don’t touch the heat sinks, some are high voltage. Now, even if you find reasonable voltages, it doesn’t mean the supply is ok (in my case it was the right level on a multimeter, but incredibly ugly on the oscilloscope). Most likely fault is still some electrolyte capacitor somewhere since Razer went for cheap junk, but there are quite a few to choose from. Best would be if you could find an ESR meter and check out the caps without removing them from the board (while the board is powered off). Sadly, I can’t say where you’d find one, seems not to be easy to find. What you also could do is to let the system run for 10-15 minutes, unplug it, and then feel around if you find any capacitors that are warm to touch. Only feel the plastic housing of the caps since some of the bigger ones hold a serious charge for a while. Don’t touch them while plugged in to power, since some are at live voltage levels. Normal capacitors should never heat up. Now, if a capacitor got so bad it shorted out, it won’t get warm anymore, but then they’re usually visibly bulging or leaking instead. The transistor with the brown gunk can you tell me what resistor it uses based on your technical background. Because of the brown gunk I can’t tell the colour rings nor what wattage it is. I know the transistor is 2n 4401 I’ve noticed somehow it broke off so I also need to replace it along with the one you replaced in above post. No, I’m sorry. And now the system is all closed up. Can’t you measure it? The wattage is almost certainly 1/8W, judging from size. They have served me so well for so many years *sniff*. This 2.1 had just so great sound for what it was and costed. 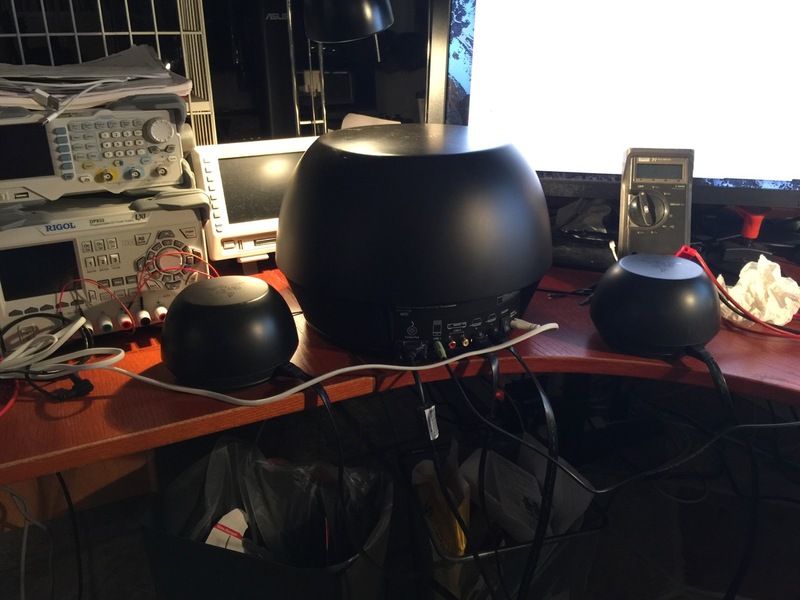 PERFECT for desktop really, with the downward firing satelite speakers. Don’t know why they did not make an updated version of this fantastic 2.1 system. I did however buy for approximately 9usd a whole replacement set of capacitors, 53 in total. Have a super weekend and know your curiosity made music play in Cape Town today! I have too also note, the capacitor was hot to the touch prior to me replacing it. Took my IR temp gun and it was at a crispy 56 degrees Celcius, enough to give me a tingle. Ps. Would replacing the dead short next to the main 400V 330µF with another 400V 330µF break or improve such a power system? I ask since my set has this strange scratching sound if it is powered on, ever since day one. No, I don’t think replacing the short with a capacitor is a good idea. I don’t think it will work at all. It could just as well be that it’s used in an alternate configuration where other components need to be removed. If I were you, I wouldn’t try it. I am thankful you found out the culprit since my mako speaker set just went silent. However, I am a bit paranoid now that the capacitors may all go bad. If I wanted to change them all (including c122, not 125 since I already had to change that) would you recommend audio grade caps? Or perhaps caps that are specially used for power supplies? Or any general caps as long as it’s not fujicon? And if so please give me a site/company you preferentially order from! Well known good brands are Nichicon and Panasonic. But you need to buy from a reputable source, else they can be fake (i.e. avoid eBay). Farnell.com and mouser.com are reliable. And no, I don’t think you need “audio caps”, just regular good quality electrolytics. Do take care that the voltage rating is as high as the original or a bit higher. There are more brands and sources, but that’s what I can think of right now. Thanks for the list. I reformatted it as a table and added to the post itself. Easier to read that way. just an observation you have 2 entries for 50v at 4.7 uF one with 20 caps the other with 2 I assume one of them is meant to be 50v 47uF ? I’d have to double check, that does seem odd. Will do so tonight when I get home. I see now that there are three entries for 25V 47µF as well. 1+2+1. Right so the reason there are some double entries are that I just wrote it as I went across the in my notebook, and when I made the list on excel I never thought of properly grouping them together. 25V 47µF there are 4. 50V 4.7µF there are 22. Ok, changed the table with the corrections now. 10k plus question. Where can I find a spare control pod for Razor Mako? On ebay nothing shows up.